Accurate diagnosis of multiple sclerosis (MS) hinges on correct interpretation of a patient’s clinical history and radiologic studies.1 Because there is no single highly specific biomarker for MS, misdiagnosis—when a patient without MS receives an incorrect diagnosis of MS—is unfortunately common. In a study of 2 independent MS referral centers, 18% of new patients referred with an established diagnosis of MS were deemed misdiagnosed.2 Those who are misdiagnosed often carry the diagnosis for multiple years until being “undiagnosed,” some carrying the diagnosis for a decade or longer.3 Objective evidence of demyelinating disease and appropriate application of diagnostic criteria is necessary to prevent misdiagnosis. Along with these physical risks, MS DMTs come at a significant cost. The cost of DMT is rising,5 with the median price in 2018 at $80,000.6 Furthermore, while misdiagnosed patients are receiving these unnecessary, potentially harmful, and costly medications, they are also going without treatment for their true diagnoses. The psychologic burden and practical consequences of eventually going through an undiagnosis of MS can be significant.7,8 Many patients with a diagnosis of MS become involved with and seek support in their local and national MS communities. Often, MS is part of their personal identity, and in our experience, this can make the undiagnosis of MS a very difficult experience. 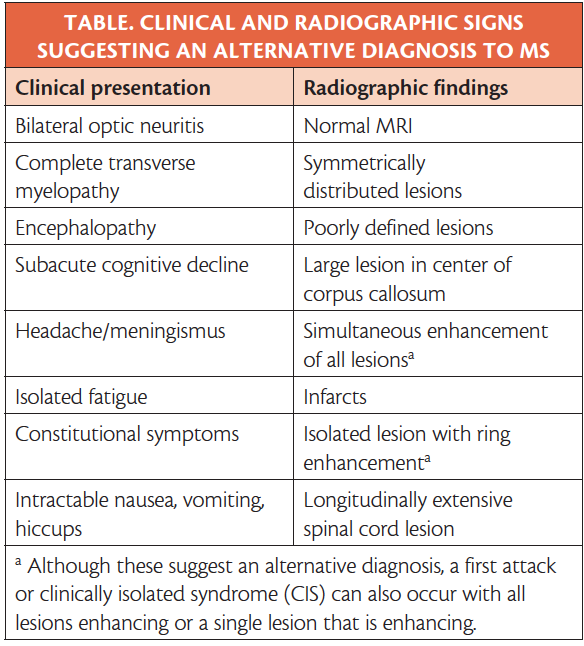 Misdiagnosis of MS typically occurs due to the misapplication of the McDonald Criteria.2,3 These criteria were designed to predict the risk of conversion from clinically isolated syndrome (CIS) to clinically definite MS, not necessarily to distinguish MS from its mimics. The criteria were developed in 20019 and since then, they have undergone 3 revisions1,10,11 to allow for earlier MS diagnosis. There are 2 independent studies suggesting that more than two-thirds of patients misdiagnosed with MS presented with a clinical syndrome that was not typical of MS.2,3 The 2017 McDonald Criteria stress their use only with clinical syndromes typical of MS; these include optic neuritis, incomplete transverse myelitis, and brainstem syndromes such as internuclear ophthalmoplegia and trigeminal neuralgia. To be considered MS-typical, symptoms should last at least 24 hours in the absence of fever and infection. Changes on objective examination or paraclinical testing should also be seen. 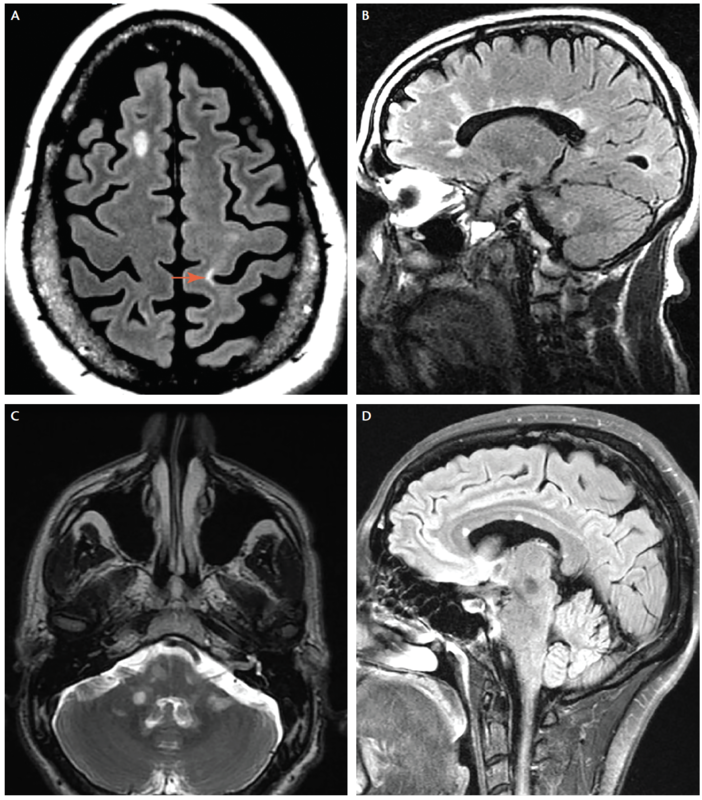 Figure 1.Typical lesions of multiple sclerosis are found in the juxtacortical (A, arrow), periventricular (B), infratentorial (C) regions and the corpus callosum (D). Figure 2. 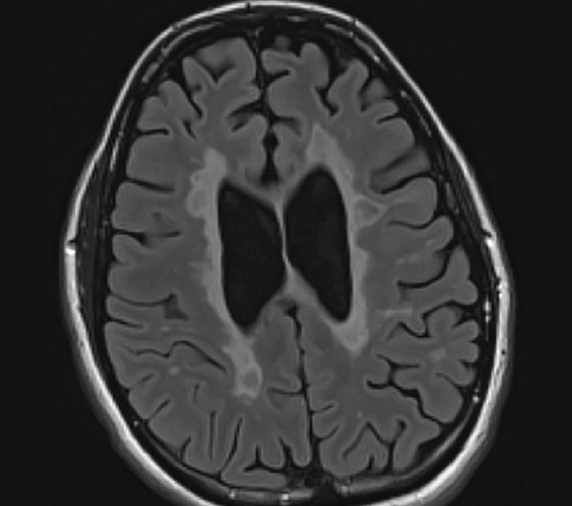 Confluent lesions may appear later in the course of multiple sclerosis. The most recent revision of the McDonald Criteria allows for a patient with CIS to fulfill criteria for dissemination in time if they have cerebrospinal fluid (CSF)-specific oligoclonal bands (OCBs).1 Patients with CSF-specific OCBs have a higher conversion rate from CIS to MS compared with those without OCBs20; however, this diagnostic tool lacks specificity, as other central nervous system (CNS) inflammatory diseases, infections, vascular events, and tumors are associated with OCBs.21 Other diagnostic tools such as visual, brainstem-auditory, and somatosensory evoked potentials lack specificity for MS as well,22 highlighting the importance of using these tools as supportive evidence rather than the basis for a diagnosis of MS. Given the increased sensitivity of the 2017 McDonald Criteria and the relatively high prevalence of MS mis-diagnosis, there is a need for more specific MS biomarkers. Burgeoning serum and radiographic biomarkers may allow for increased diagnostic specificity. One radiographic biomarker under investigation is the central vein sign. Autoregulatory T cells enter the CNS through the systemic circulation, leading to a perivenular distribution of white matter lesions that may be a helpful distinguishing characteristic of MS.23 In a prospective study of 29 patients with potential MS in whom the diagnosis could not be confirmed at initial evaluation, all patients who ultimately received a diagnosis of MS had central veins in over 40% of their brain lesions, whereas those who received an alternative diagnosis had central veins in less than 40% of brain lesions.24 Although promising, this study was completed at a field strength of 7 Tesla, far higher than what is presently available in clinical practice. Serum and CSF biomarkers may also help guide diagnosis of MS. Neurofilaments are proteins released into the extracellular space during axonal breakdown.25 Elevated levels of CSF neurofilament light chains (NfL) are associated with risk of progression from CIS to clinically definite MS.26 Elevated levels of NfL have also been shown to correlate with disease severity and progression in MS.27 Although this research is promising, elevated NfL levels are found in many neurodegenerative diseases, and increase with normal aging.28 Lack of specificity for elevated NfL levels may limit use for MS diagnosis, but further studies may delineate a use in the young and otherwise healthy patient presenting for evaluation. There are also data supporting the use of multiparametric assays assessing the expression of multiple genes or proteins. In contrast to a single biomarker, these assays aim to determine a pattern of expression of many genes or proteins at once to aid in diagnosis and prognosis. One such study investigated serum long noncoding RNA gene expression to identify clinically definite MS.28 This test reports a sensitivity of 91% and specificity of 98% for RNA gene expression tests against healthy controls, but a lower sensitivity of 79% and specificity of 87% when compared with patients with autoimmune and other chronic diseases.29 While early in development, these assays may provide a suitable biomarker to aid in diagnosis. Accurate diagnosis of MS is challenging, and misdiagnosis occurs relatively frequently. This has wide-ranging implications including the risks and costs of MS treatment as well as psychologic stress. Though outside the scope of this article, underdiagnosis also occurs, with some patients presenting to numerous physicians prior to receiving a diagnosis of MS. To more accurately diagnose MS, we must be vigilant in our use of the McDonald Criteria, with careful consideration of whether symptoms correspond to a typical clinical syndrome, corroboration of symptoms with the neurologic examination, correct interpretation of radiologic and CSF data, and thorough evaluation for MS mimics. Identifying and validating novel biomarkers for more accurate MS diagnosis will decrease our reliance on radiographic findings and significantly enhance patient care and outcomes. 1. Thompson AJ, Banwell BL, Barkhof F, et al. Diagnosis of multiple sclerosis: 2017 revisions of the McDonald criteria. Lancet Neurol. 2018;17(2):162-173. 2. Kaisey M, Solomon A, Giesser B, Sicotte N. Misdiagnosis of multiple sclerosis: prevalence and characteristics of misdiagnosed patients referred to two academic MS centers. Presented at: European Committee for Treatment and Research in Multiple Sclerosis, October 11, 2018:P655. 3. Solomon AJ, Bourdette DN, Cross AH, et al. The contemporary spectrum of multiple sclerosis misdiagnosis: a multicenter study. Neurology. 2016;87(13):1393-1399. 4. Rommer PS, Zettle UK. Managing the side effects of multiple sclerosis therapy: pharmacotherapy options for patients. Expert Opin Pharmacother. 2018;19:5:483-498. 5. Hartung DM, Bourdette DN, Ahmed SM, Whitham RH. The cost of multiple sclerosis drugs in the US and the pharmaceutical industry: too big to fail? Neurology. 2015;84:2185-2192. 6. National Multiple Sclerosis Society. Access to MS Medications. 2017. https://www.nationalmssociety.org/nationalmssociety/media/msnationalfiles/advocacy/2017-ppc-access-to-ms-meds-leavebehind.pdf Accessed December 27, 2018. 7. 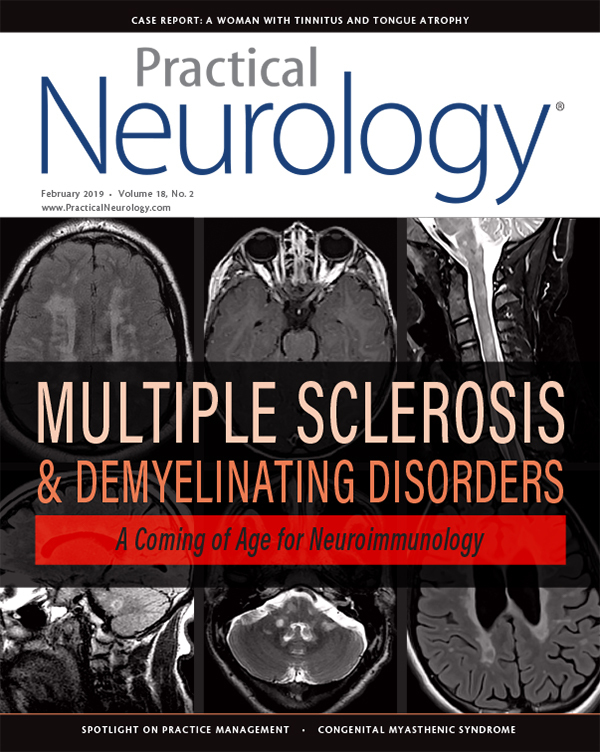 Solomon AJ, Klein EP, Bourdette D. “Undiagnosing” multiple sclerosis: The challenge of misdiagnosis in MS. Neurology. 2012;78(24):1986-1991. 8. Solomon AJ, Klein E. Disclosing a misdiagnosis of multiple sclerosis: do no harm? Continuum (Minneap Minn). 2013;19(4):1087-1091. 9. McDonald WI, Compston A, Edan G, et al. Recommended diagnostic criteria for multiple sclerosis: guidelines from the International Panel on the diagnosis of multiple sclerosis. Ann Neurol. 2001;50(1):121-127. 10. Polman CH, Reingold SC, Edan G, et al. Diagnostic criteria for multiple sclerosis: 2005 revisions to the “McDonald Criteria”. Ann Neurol. 2005;58(6):840-846. 11. Polman CH, Reingold SC, Banwell B, et al. Diagnostic criteria for multiple sclerosis: 2010 revisions to the McDonald Criteria. Ann Neurol. 2011;69(2):292-302. 12. Barkhof F, Filippi M, Miller DH et al. Comparison of MRI criteria at first presentation to predict conversion to clinically definite multiple sclerosis. Brain. 1997;120:2059-2069. 13. Fossey SC, Vnencak-Jones CL, Olsen NJ, et al. Identification of molecular biomarkers for multiple sclerosis. J Mol Diagn. 2007;9(2):197-204. 14. Brownlee WJ, Hardy TA, Fazekas F, Miller DH. Diagnosis of multiple sclerosis: progress and challenges. Lancet 2017;389(10076):1336-1346. 15. Kister I. The multiple sclerosis lesion checklist. Practical Neurology. 2018;68-73. 16. Yamout BI, Khoury SJ, Ayyoubi N, et al. Alternative diagnoses in patients referred to specialized centers for suspected MS. Mult Scler Rel Dis. 2017;18:85-89. 17. Carmosino MJ, Brousseau KM, Arciniegas DB, Corboy JR. Initial evaluations for multiple sclerosis in a university multiple sclerosis center: outcomes and role of magnetic resonance imaging in referral. Archs Neurol. 2005;62(4):585-589. 18. Aliaga E, Barkhof F. MRI mimics of multiple sclerosis. Handbook of Clinical Neurology, Vol. 122 (3rd series). Multiple Sclerosis and Related Disorders. Ch. 13. 19. Boster A, Caon C, Perumal J, et al. Failure to develop multiple sclerosis in patients with neurologic symptoms without objective evidence. Mult Scler. 2008;14(6):804-808. 20. Ignacio RJ, Liliana P, Edgardo C. Oligoclonal bands and MRI in clinically isolated syndromes: predicting conversion time to multiple sclerosis. J Neurol. 2010;(7):1188-1191. Erratum in J Neurol. 2010;257(7):1231. 21. Correale J, de los Milagros Bassani Molinas M. Oligoclonal bands and antibody responses in multiple sclerosis. J Neurol. 2002;249(4):375-389. 22. Kjaer M. Evoked potentials in the diagnosis of multiple sclerosis. Electroencephalogr Clin Neurophysiol Suppl. 1987;39:291-296. 23. Sati P, Constable RT, Guttman CR, et al. The central vein sign and its clinical evaluation for the diagnosis of multiple sclerosis: a consensus statement from the North American Imaging in Multiple Sclerosis Cooperative. Nat Rev Neurol. 2016;12(12):714-722. 24. Mistry MA, Dixon J, Tallantyre E, et al. Central veins in brain lesions visualized with high-field magnetic resonance imaging: a pathologically specific diagnostic biomarker for inflammatory demyelination in the brain. JAMA Neurol. 2017;70(5):623-628. 25. Petzold A. Neurofilament phosphoforms: surrogate markers for axonal injury, degeneration and axonal loss. J Neurol Sci. 2005;233:183-198. 26. Van der Vuurst de Vries RM, Wong YYM, Mescheriakova JY, et al. High neurofilament levels are associated with clinically definite multiple sclerosis in children and adults with clinically isolated syndrome. Mult Scler. 2018; May 1: 1352458518775303. 27. Kuhle J, Barro C, Disanto G, et al. Serum neurofilament light chain in early relapsing remitting MS is increased and correlates with CSF levels and with MRI measures of disease severity. Mult Scler. 2016;22(12):1550-1559. 29. Tossberg J, Crooke P, Henderson M, et al. Using biomarkers to predict progression from clinically isolated syndrome to multiple sclerosis. J Clin Bioinforma. 2013;3:18. AG reports no disclosures. MK has received consulting fees from Biogen and Celgene.